The book is subtitled appropriately “A Global Roadmap for Radical Economic and Political Reform.” It functions in a substantial way as the missing “content” for the Occupy Wall Street movement people who know that global capitalism and its political elite are screwing the middle and lower classes and the world environment but don’t know exactly how they are doing it and how to change things. The book provides an unusually lucid analysis of the American political-economic system which should make clear to the Tea Partiers what their real targets of rage should be (it’s not merely the Democrats nor the federal government.) Nearly everyone else who wants a “big picture” comprehensive analysis of the global economic system will be educated by this book. The author, Ross Jackson, identifies who and what is responsible for the 2008 financial meltdown and many other problems in society. Most prominent are a seriously-flawed “neo-liberal economic philosophy” and the political-elite class which sponsors that philosophy for self-interested reasons at the expense of the rest of us. Jackson makes clear that economic philosophical theory is not value free and is class politics in disguise. But way more importantly than the mere class versus class struggle, the neo-liberal economic philosophy has created severe energy and environmental problems which are almost certain to lead soon to major economic and political disruptions affecting the entire globe. Jackson is bound to be (or at least should be) hailed as a top-notch public intellectual. He is a brilliant analyst of global economics, politics, and environmental matters; and a clever synthesizer of the relevant economics, politics, philosophy, environmental science, psychology, sociology, history, physics, and biology, which apply to his examination. He has an unusually broad and diverse background as a global currency trader, executive of a non-profit environmental organization, software designer and businessman, with degrees in engineering physics, industrial management, and operations research. This may explain, in part, his ability to see major categories of human life with such a wide lens while also being able to analyze the subcategories and the factual data. He clearly explains how and why the 2008 financial crisis occurred and why it is likely to repeat itself, and how the current debt crisis in Europe (and elsewhere) happened and why the European Union is not equipped even now to successfully deal with it. Any effort to address it (using the existing neo-liberal strategies) will be temporary and the crises will deepen. 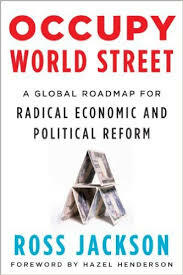 His discussions on the neo-liberal insistence on a deregulated economic environment, free flow of global capital, and the use of exotic financial instruments and transactions, especially naked derivatives, are the clearest I’ve read about how these elements de-stabilized the global economy. He thoroughly and lucidly explains how this political-economic philosophy destroys real democracy, including in America. What we have, he says, is a corporatocracy which dominates much of political and social life through the forces of wealth and ideology. Mr. Jackson is a political-economic visionary of the highest order as shown in the second half of the book by his “breakaway” strategy where he sets out his alternative environmentalist paradigm. It is a new worldview emphasizing the finite reality of our natural resources, especially energy ones, and how we should alter much of what we do to comply with that reality. He argues for a new set of social values harmonious with a holistic sense of people and nature being part of one “system.” The values of that system include smallness, localization, quality versus quantity, interrelationships, and long-term perspectives. These values are organized into a moderately sophisticated set of new global political and economic institutions modeled much like the European Union but emphasizing environmental issues and designed to satisfy long-term environmental needs. This process will also lead to enhancing of true human values in the political sphere, especially in more effective democracies. The “breaking away” strategy starts with small nation states building a new economic paradigm based upon the environmental perspective, rejecting the flawed and elitist global institutions we have now (the WTO, World Bank, and the International Monetary Fund), and even developing new currency systems. The nation states will be supported by a grassroots activist movement which will create local eco-communities and more self-reliant economies while lobbying existing political powers to get on board with the new paradigm. The measurements of success will not be GNP or GDP but the broader-based measures of social happiness and human rights.